We have a new preheater in our product range as this is different from the normal preheater technology with a heater element submerged into the water and on/off regulation. This patented new technology uses self-regulating heating elements without any direct contact between water and heater element. A big advantage is that installation can be done both vertical and horizontal position without risk of breakdown under dry running. 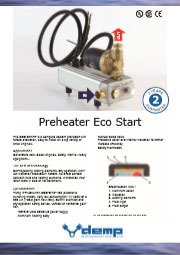 The preheater can be delivered with or without pump to suit all types of applications. Further details are available upon request so please contact us.